Packed and ready the next morning we were greeted by our taxi to the bus depot. It was more of a tuk tuk vs flatbed truck with metal seats in the back, but it was only for 20 mins or so as we went around the hotels collecting people. We then got into ok little minibus where I once again blagged the front seat, so it was quite a comfortable 3.5hr journey. 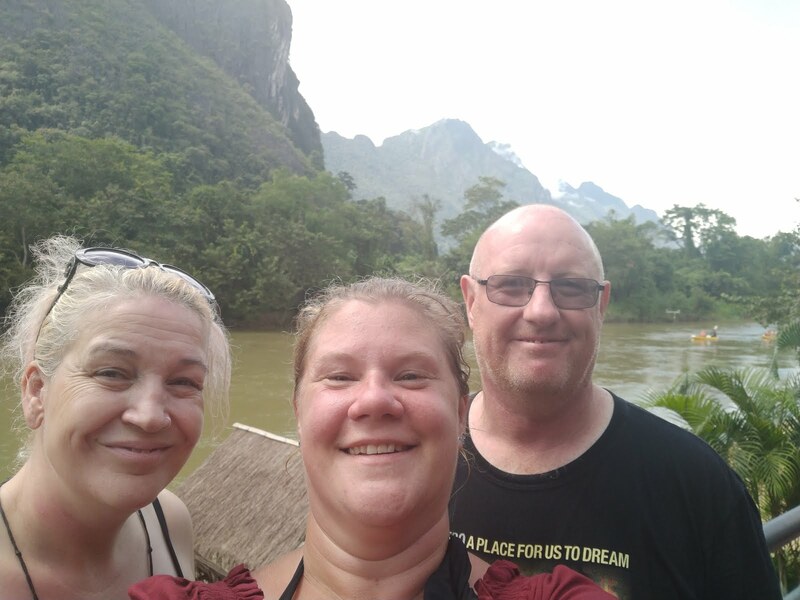 Around 2pm we arrived on a dusty main road and walked the 5mins to the Vang Vieng homestay, which was on the slightly quieter edge of the town. We had 2 perfectly clean and comfy rooms, although Jane did have a large 8-legged lodger, with private bathroom and A/C. The resort even had a pool which we didn’t use but looked very inviting. The town is surrounded by magnificent mountains and the views are breath-taking. We found a couple of little bars (our fav one was called Earth) that had seating areas overlooking the river with the mountains as a backdrop, and this is where we could be found each night watching the sun set with a cold beer or cider. On the bus coming here I’d started to question why we, a couple of lazy overweight older travellers, were going to a place so high on the ‘active / adventure’ trail but when we got there even we were sucked in by the posters and fun looking packages. We spent a whole afternoon trying to decide between a Hot air balloon ride, Buggy cars, Ziplines, Kayaking or Tubing but with limited time and funds we finally decided to just do a morning of Ziplines and then an hour or so tubing on the river. 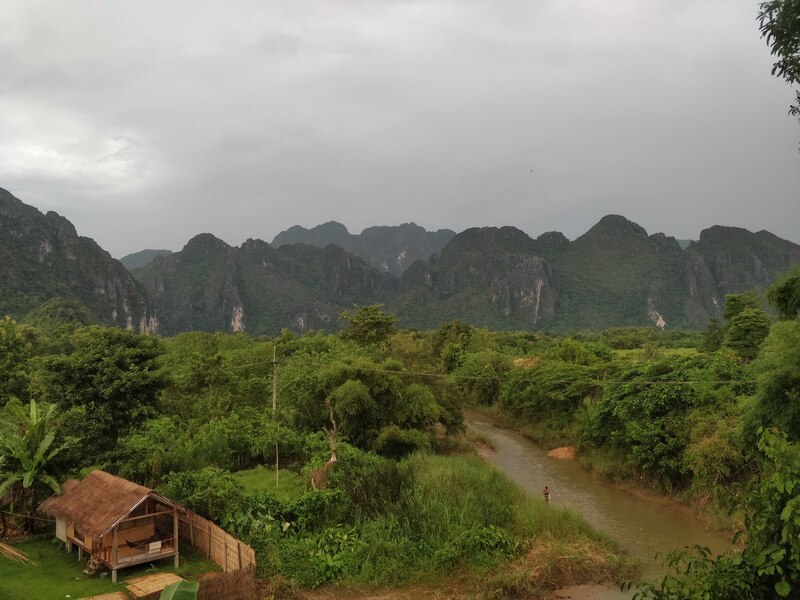 Vang Vieng used to be infamous for its tubing scene, or maybe just for the record amount of deaths they had 1 year, but they have changed and cleaned up their act over the last few years plus we weren’t doing the pub crawl tubing route. We organised our ziplines and the tubing through the tour guide opposite our hotel and the two together plus transport cost 160,000 kip each, which is about £15. Our day started at 8:30am where we all got branded with the initials of our paid for activities then jumped in a TCK tour marked truck. After a few more pickups and a 20 min drive out of town we arrived at a river side building where a few other trucks full of people were waiting. The bold initials on our hands made it easy for the guides and instructors to section people off for the various activities and it wasn’t long before we and about 20 other people were harnessed up and ready to zip line. 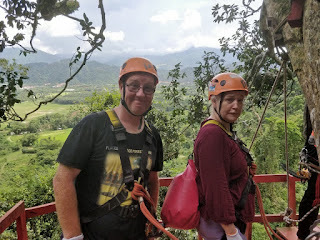 We had a brief demonstration where I volunteered to do a test zipline, just to make sure I wouldn’t freeze up when we got to the high ones, and then we were off onto a boat across the river. A truck takes you up the steep road to the first zips and after a safety check and a short climb up a hill we were on our first platform waiting to zoom through the trees. The views were stunning, the instructors were brilliant; really professional and I had the best time, even when I was terrified and started to have a mild panic attack when walking on some hanging logs and when they ‘dropped’ me during the final abseil descent! The highlight of the morning had been the young Asian girl that was so scared during the first few zips that she screamed and had to be accompanied by the instructor, finally she got brave enough to do them on her own but her final abseil, which Paul has tagged onto the end of our video, had everyone in stitches. When back at the riverside base we got a free lunch of BBQ chicken, rice and bread plus a paid for beer before we were herded into a waiting tuk tuk with 2 other girls for the tubing experience. After a few km we turned off down to the muddy riverside and we loaded all essentials into dry bags which went in the guides kayak and we launched ourselves into the river in rubber tubes. We had two guides with us in kayaks, not because you really needed them, but they were on hand in case the rapids capsized you. In actual fact we handled the rapids perfectly in our tyres and just got a few mouthfuls of river water but one of the guides went over in a kayak and got his phone and belongings wreaked, luckily for us it wasn’t the one loaded with our shoes and dry bags but I felt bad for him. After an hour of drifting through amazing scenery, which obviously we didn’t get on camera, we stopped at a restaurant / bar for a quick rest before heading back to town for coffee and cake. We had a lovely quiet night watching the sunset behind the mountains and drinking a few beers before packing for our early bus to Phonosavan the next morning. Morning brought with it a burst water valve, so our entire hotel block had no running water for showers or toilets. Obviously, there was nothing we could do so 3 slightly grumpy people got on the tuk tuk to the bus depot at 8:40. We arrived to find an already full and very battered blue minivan that was supposed to be our transport down the windy 4 hr road to Phonosavan. Our luggage was whisked away onto the roof rack before we could stop them and we were urged to squeeze 14 people into a 12-seater minivan! There were 3 other European backpackers plus ourselves that found this situation unappealing and I honestly don’t recall who first started the grumble of discontent but it ended up with Paul, Jane and myself refusing to travel in this van. Obviously once we’d been unloaded this meant there was enough seats for everyone else, so we waved the clapped-out minivan off and started weighing up our other options. The bus terminal said there was another van going to Luang Prabang and he could drop us off at Phou Khoun, which is halfway and where the road splits off to Phonosavan, from there we would wait for another van to take us to our destination. It sounded good but there was a risk factor of missed connections, more overbooked vehicles, motion sickness and we were still feeling pretty grumpy. We worked out that it would only be about another 230,000 kip each to get our own private a/c minivan and so after a quick conflab that’s what we did. 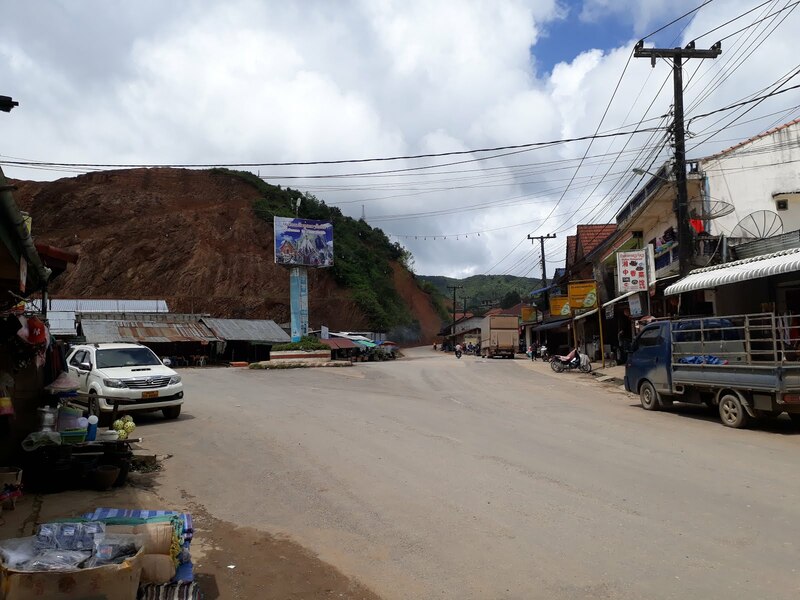 The van driver, like many others in Asia, only knew how to drive at breakneck speed and we flew along the windy roads, overtaking a battered blue minivan within the first couple of hours and reaching our destination in 4 hours. 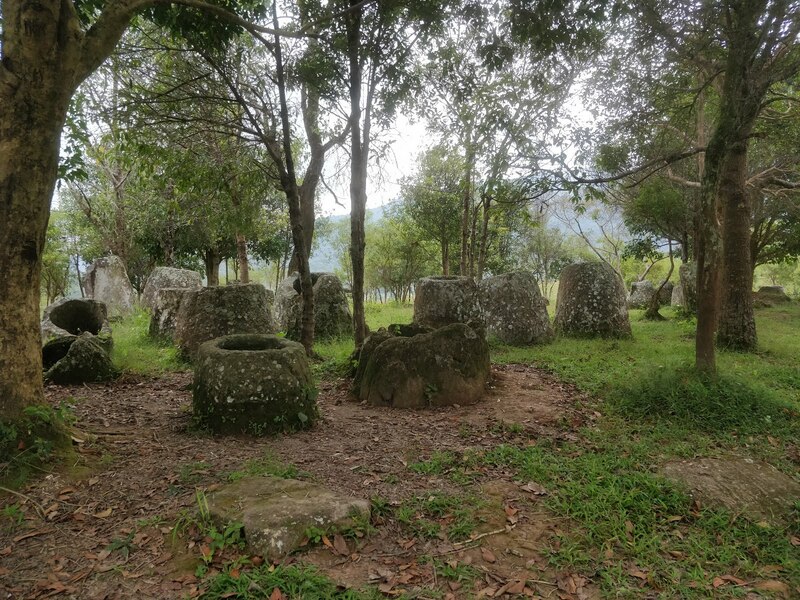 Phonosavan isn’t a pretty town, it’s one dusty main road with a handful of scattered guesthouses and restaurants but it is where you stay to visit the Plain of Jars which was a strange mysterious site we’d heard of and a bucket list tick for Jane. It isn’t just one site, there are over 40 but most them have not been cleared of UXO’s so it’s unsafe to visit, the 3 main sites have been cleared, or at least have marked paths that you stick too when you visit. At these sites you can find big and small stone pots, or jars which no-one really knows how or why they got there as the local tribes have all died out. One folklore story that captured my imagination says that a tribe of giants lived here and these are the drinking cups left strewn about after a 6-month celebration, science tends to lean towards them being some sort of burial or cremation vessel….. I think you know which one I’m going with. We were staying at a fairly new hotel about 5 mins walk from the main market and café hub called Fananhmai. It was clean, had a/c and a fridge in each room but the worst pillows of our entire 10-month trip. After a settle in we went out for a wander round the covered food market where we were treated to the sights and sounds of live larva (couldn’t figure out if they were bee larva) and bowls of maggots for sale as well as the now standard fried insects, chicken feet and piles of bright veg. 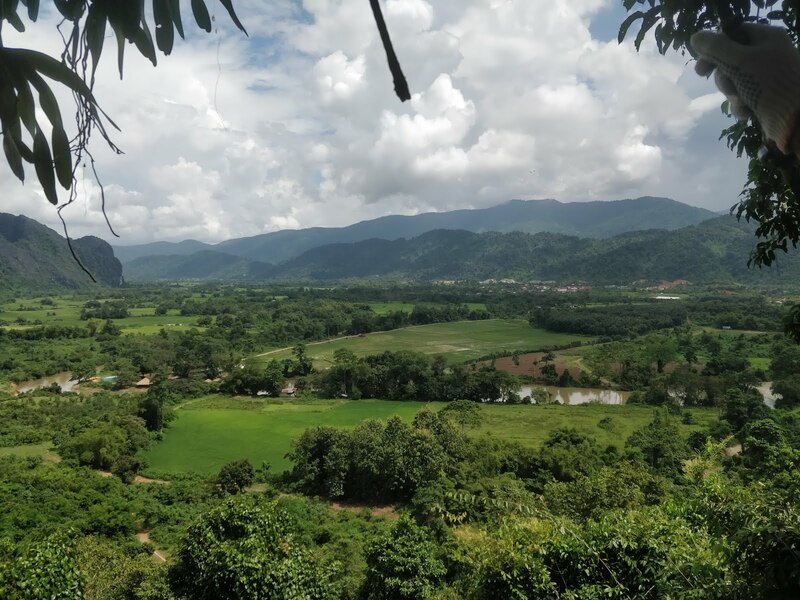 There is a lot of war related sites around Phonsovan as well but as we had already done much of this in Vietnam we just opted for a tour of the 3 main jar sites, plus a quick trip to the old provincial capital of Muang Khoun. We booked through the café / tour guides at Bombies and it worked out as 160,000 kip each for a private a/c minivan with no guide. It might seem like 3 jar sites would be overkill but they are all quite different. 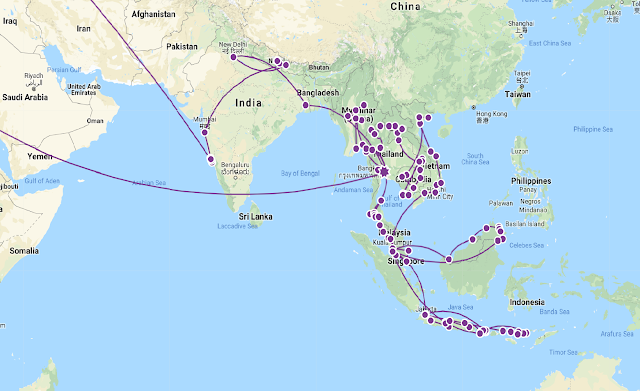 We started at site 3 and after gate-crashing a local buffet lunch party in search of the ticket booth, our driver pointed out a rough track through some rice paddies and said go that way. So off we went on a thin muddy track round fields and over stiles until we all got a fit of the giggles because we had no clue where we were going and hadn’t seen any jars yet! Spotting some MAG (Mines Advisory Group) markers which denote the UXO cleared path to the jars we continued through cattle fields until we got to a small fenced off wooded glade and inside we could see many small to medium sized jars. It’s a pretty little site and apparently has the most concentrated number of jars but it didn’t give us any clues as to what they might have been used for. Next was site 2 which very close down another bumpy dusty road. We stopped to buy tickets and it was then that our trusty minivan decided to break down! We all tried to resurrect it but as it sounded terminal we left the guide talking to his boss and we walked the final 10min to the jar site. They have 2 groups of jars here but the prettiest one is to the right, set on top of rolling green fields with a heard of cows all wearing cowbells grazing next to you. It didn’t look like Asia at all. The van although now working was not going to be trusted to complete our day so a car and new driver was being sent from town to continue the tour. 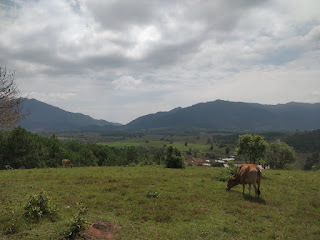 Half hour later we were heading off towards the old capital Muang Khoun. This is even less of this town than Phonosavan but they do have an old destroyed temple with a large war marked Buddha, an old ruined government building plus two old stupas nearby. They ask for 10,000 kip entrance to both the Buddha and Stupas, which seems a bit cheeky as you aren’t at either site for long, but then you remember it’s not even a £1 and does contribute a bit of money to the upkeep. Our final visit of the day was Plain of Jars site 1, which is the largest of the 3 sites and hence has the largest jars. This site was 15,000 kip each to enter but they do provide a shuttle bus from the ticket booth to the first group of jars, which saves you a 10 min walk one way, we couldn’t figure out how you let them know you want to come back so just walked back. Tired after a full day looking at stone jars we went back to the hotel for a couple of hours before heading out to get a bus ticket to Luang Prabang for the following morning.